Death comes in many colours: Black, which isn't a colour, Red (which was just wearing a mask), Green which at least recycles, and of course the colour Purple which takes two and a half hours but feels like more. Listen, this Purple Death isn't just from Outer Space either; it's dusty death as well. It gets everywhere and in black and white too so you can't even tell it's being purple. Who can save us from this monochromatic interstellar menace? 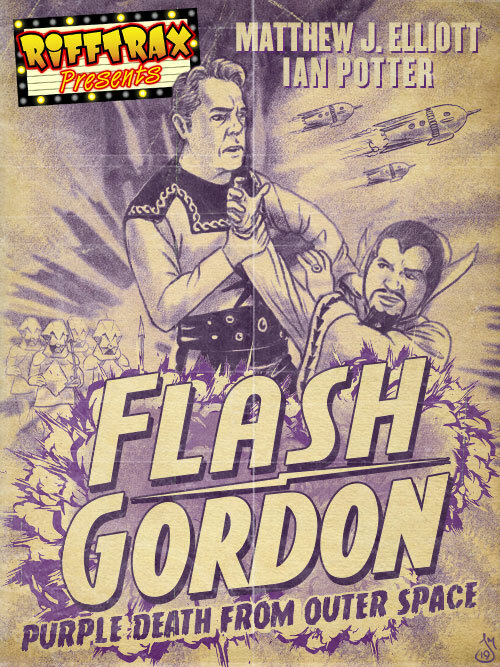 Why Flash Gordon, Professor Zarkov and (to a much lesser degree) Dale Arden - that's who! Thrill to mustachioed men in tights who sound more British than your riffers! Swoon as sparky space ships swing through the stars like some things on strings! Gasp at the actually comprehensibly edited story that makes this serial turned movie almost 97% not just flying back and forward from Space committee meetings! Matthew J. Elliott and Ian Potter are your guides to Ming the Merciless' Mongo and we're making sure you see all the good bits with rob'ts, feathers and dancing girls! I am assuming this is the dark origin of The Grimace.